I came back to my hotel room late last night from a fantastic dinner with great company (thanks again Will) and crashed before checking my feeds. What a tidal wave! The news about Robert moving to PodTech.net has completely taken over Memeorandum (and temporarily crashed PodTech's servers because of the traffic)! I looked at my cell phone and I think there was a call from Om Malik that I ignored (sorry, Om, I didn't know you were calling about THAT). Then the email started coming in. Oh, crud. It was out. It also means that the reasons and circumstances of Robert’s leaving were subjects to rumors and supputations, so much so that Robert had to counter most of them in Correcting the Record about Microsoft. I don’t think that Microsoft is going to suffer the setbacks that some posts are predicting, first because the changes that Robert and the other 3000 bloggers of the company have helped kick in gear are already under way, and second because other bloggers (like Niall Kennedy, yes buddy, yours to fill the gap now) have an opportunity to make a similar impact. I just spoke to Robert for a few minutes ago to congratulate him and Maryam for the move, and I need to do did the same with John who has scored yet another coup by luring the most well known corporate blogger to his startup. I look forward to hearing more about Robert’s new role at PodTech, but what is clear is that he will contribute to getting podcasting, and I would bet video-blogging, to its next milestone, using his footprint in the both the corporate and consumer worlds to evangelize it. There will be more news coming in the next few days, especially since we only heard one side of the story (cryptic statement that will make sense later this week). And I can't wait for the leaving party (or parties) that will take place around Gnomedex since Robert's official starting date is July 1st. Update: Dan Farber reports on his meeting both Robert and John at Vloggercon. My good friend Gil Penchina, the former VP International of eBay, has taken the CEO spot of Wikia, the company offering a wiki-based infrastructure to build open editable communities, per the official press release. Mike Arrington and Gil have also recorded a TalkCrunch podcast, and I recommend listening/watching Gil's intervention at the Entrepreneurial Thought Leaders Seminar. I actually expected Gil to join a VC firm (and he definitely could have done so) but he decided to jump in the startup world - hats off for that, and I look forward to seeing what happens to Wikia in terms of growth and commercial success. Note that in true Wiki approach, the “About Wikia” page can be edited and I added Gil to the page since he was not listed there yet. Today also saw other announcements, namely Tara “Pinko Marketing” Hunt leaving Riya, Philippe Kaplan passing the reigns of AdBrite to Iggy Fanlo and Mark Fletcher leaving Ask/Bloglines to look after his cats start thinking about his next company. I blogged yesterday about the panel I am participating to at the eBay Developer's Conference, on Community and Social Tools - and what they mean to the eBay ecosystem. It sounds like Laura Merling, Kevin Rose, Ross Mayfield and I will have an easier job convincing the crowd that these tools can be of great benefit. AuctionBytes just announced that eBay blogs and community wikis were being launched at eBay Live. eBay will be introducing eBay Blogs, another way to give sellers an opportunity to market themselves, as well as an eBay Community Wiki. eBay is holding sessions on the new tools at the upcoming eBay Live conference in Las Vegas June 13 - 15. The session called “It's not About Me, it's eBay Blogs!” shows conference attendees how they can use eBay Blogs to write about the things they sell and build their networks. Another session, called “Wiki 101 - An Overview of the eBay Community Wiki,” defines Wikis in general, looks at Wiki implementation on other sites, and discusses Wiki features eBay provides to the Community. eBay has already created a discussion board devoted to eBay Blogs, though it's not yet available on its main list of discussion boards. A community blog called the Chatter has also been launched last month, hosted on TypePad - and more interestingly, with a TypePad URL: http://ebaychatter.typepad.com/the_chatter. How about listing blogs hosted on edgeio (Disclaimer: one of my investments) ? The Wine Spectator is one of the leading US publications on the world of wine, featuring reviews, ratings, analysis, etc. The ratings are particularly influential when it comes to how well a given wine will sell, and for how much. Wine Spectator Online subscriptions ($49.5/yr) can be purchased separately from the magazine in order to access to their extensive wine ratings database, articles, etc. The latest addition to the content: blogs, developed by five of the editors/columnists. The blogs make an interesting contrast with our forums. For many years, this site has offered an open forum--and I mean open--where wine lovers can gather to discuss a wide range of wine topics or just rant. These forums are very popular. Thousands of wine lovers have signed up as members, and many more “lurk” on the site just to read the discussions. Some threads end up with many thousands of viewers. It is our way of giving wine drinkers access to a community and a home to visit. But some of our editors have been reluctant to comment there, myself included. For one reason, the site allows posters to use screen names. While most posters behave responsibly, there are some who write inappropriately from time to time, saying things they would be otherwise afraid to say if they were required to use their real names. Some clearly have a hidden agenda, though we have no way of knowing exactly what it is or who they are. The beauty of the new editors' blogs is that they are offered behind a wall--that is, only online subscribers can read them and post comments. Everyone is required to use their real names. RSS feeds are available: all blogs, daily wine picks, etc. Daily picks are available as a free full feed, which is great. Only headlines are available for blog posts, content has to be read on the site - which is a bit of a bummer. I should be able to enter my subscription password in order to access the content in my feed reader, or at least the first paragraph of each post should be made available as a partial feed. I would also add support for trackbacks in order to bring in “outside” conversations, and FeedFlare-like features to the feeds. Not perfect yet, but a very welcome development. And it is interesting that blogs are used to develop further the Wine Spectator community, as opposed to being used as a lead generation/subscription conversion mechanism. Update: I have been following some of the conversations between Wine Spectator's editors and their readers/commentators, and I confirm the sentiment of having an expert, or at least highly clued-in, audience getting involved on these blogs. Definitely worth the read. OnHollywood: Consumer Generated Media - What is it worth ? 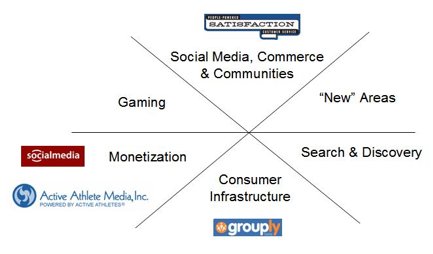 The first question is whether user generated media is now mainstream, and which metric is used to establish the answer. Ron Bloom asserts that within 5 years over 50% of content consumed by end user will be user generated. On value attributed to user generated content, Mary explains that the equation is not only how much money is mande directly from “content sales”, but revenue opportunities generated because of the content – as in the reputation, credibility and visibility. Therefore only a very small subset of user generated content producers will be able to make a living out of advertising, but a lot of people will get jobs, gigs, book contracts, etc. because of their blog/podcast/vlog. This is not a new argument by the way, since it was already discussed and agreed upon at BloggerCon3. On cannibalization of mainstream media, Ron Bloom explains that podcasters actually become a new distribution and promotion channels for licensed content like music, and he points to increased sales of music CDs following podcasters playing them on their show. In that case, podcasters reported the fact that they played the music to rights holders but did not pay for it. On direct monetization, Mary Hodder points to Revver’s model to share advertising revenue with content publishers, and expresses her surprise that to date none of the other large media sharing sites have implemented a similar approach. The issue however is that Revver needs to generate a ton of traffic in order to make that concept work for themselves - and their publishers. And today the YouTube approach of distributing unmoderated content is generating an 80X difference in streams being served (even though it is starting to backfire on YouTube). The acquisition brings Viacom and its MTV Networks unit the premier community that connects online gamers. Xfire and its users fit squarely into the Company’s multiplatform strategy to build an engaging universe of music, gaming, entertainment, news, networking and interactivity for focused audiences. As part of MTV Networks, Xfire will be better able to maximize its advertising revenues through more aggressive marketing, greater global penetration and comprehensive integration with the Company’s other digital and cable properties that address the gaming demographic. Launched in 2004, Xfire has four million registered members who use its software. Its one million active users average 91 hours per month, with an average session length of over three hours. The robust, ad-supported Xfire application supports hundreds of the latest PC games and provides social networking, instant messaging and information for online gamers. In addition, the Xfire application provides traffic to its popular website, featuring forums and gaming downloads. Xfire had received between $10M and $20M (?) in funding from DFJ, NEA and Granite Global Venture (Series C of $5M in 2004, Series D of $5M in 2005) plus several million dollars in their Series A & B (which I could not find exact information about) when they were still called Ultimate Arena. Xfire was actually featured this month in the DFJ newsletter (scroll down). This exit is providing useful data points for our team at Userplane (Disclaimer: one of the companies I am involved in), that now supports over 100,000 communities with its Flash-based IM and chat room service - including MySpace, Friendster and most brands in the online dating world. Already profitable, and without any VC funding, the company has found ways (i.e revenues) to grow organically into supporting millions of users. Esther Dyson recently met with CEO Mike Jones and has a nice write-up on her Flickr blog.